I’m having a big party and want to serve red and white wine, but I only want to use one type of wineglass. What do you suggest? I think an all-purpose set of quality glassware is a terrific investment for wine lovers, because it will help you enjoy your wine. There are a lot of variables and brands and specialty glasses out there, but nice options start at about $15 a glass, and less if you're buying a set (or take advantage of holiday sales). If your budget can go up to $20 or $25, you’ll have even more options. I don’t have an endorsement deal with a wineglass company yet, so I’ll just give you some general advice. Most important, look for glasses with a thin rim. I used to recommend hand-blown glass, but there’s been a lot of advancement in machine-made glasses in recent years, so there are more options now. For a single, all-purpose shape, I’d recommend a tall Bordeaux-style glass (versus the wider-bowled Burgundy styles). I find this shape works well with a wide range of wines, including sparkling and dessert-style wines. I like that they’re a little easier to handle and swirl. They should taper in slightly at the top to concentrate the aromas. I wouldn’t pick anything smaller than 10 ounces—my all-purpose glasses hold more than 20 ounces, but I am an absent-minded swirler, and a bit of a klutz sometimes. Those glasses keep the wine in my glass and not on the tablecloth. If you can, try to hold them in your hand first to see how they feel, and imagine you’ll have about a third of the glass full of wine. Will you be able to do a healthy swirl without spilling? Does it feel balanced? Or is it too top-heavy? I’m not a fan of stemless wineglasses because fingerprint smudges drive me nuts, but they are a good option for households with limited cupboard space or excitable tail-wagging dogs. They're certainly easier to fit in the dishwasher. I’ve found that wineglasses are a deeply personal choice. I have a couple of specialty glasses that represent the types of wines I drink most often, and Champagne flutes that I like to hand out to guests when they arrive (but some of my colleagues have convinced me that sparkling wine is best enjoyed in a larger glass). If it’s within your budget to expand your collection, have fun. I’ve been lucky enough to sit through a few wineglass seminars to know that there’s some science behind all of those shapes, and they can matter. But please treat yourself to some good basic glasses. 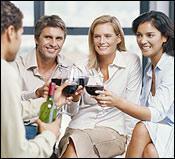 I remember the first time I set a table and everyone had the same wineglass. I felt like I unlocked an impressive adulting achievement.